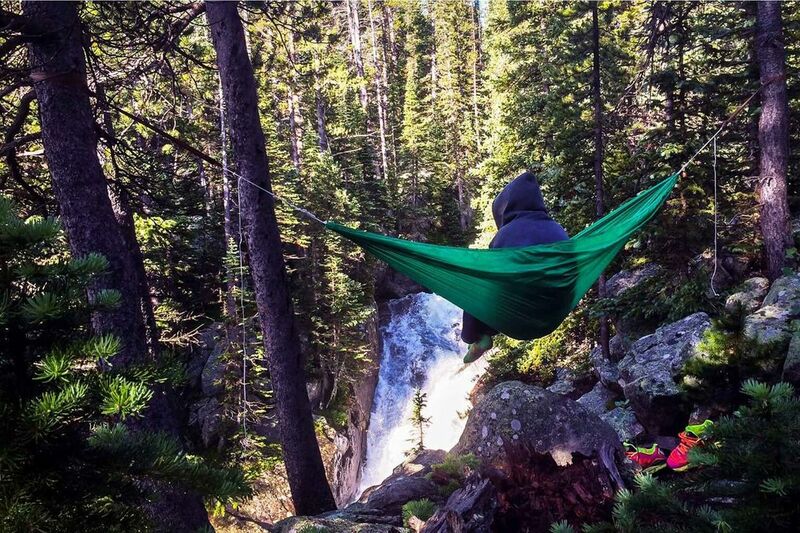 Why modern hammocks are now a camping-season staple — and which deserve a place in your kit. The beach was a postcard-perfect scene. Acres of pristine sand, azure blue water and a blazing hot sun above. My wife and I were vacationing on the Pacific island of Samoa, and our small beachfront resort had loads of scenery, but little in the way of amenities. Perfection had a big exception: no beach chairs for miles. That’s when we unrolled our lightweight travel hammock, and soon we were gently swinging together in the shade. In seconds, a pair of palm trees was transformed into the ideal place to spend the day. “This thing is worth its weight in gold.” That’s what I think whenever I reach the end of a long hike and slide into my hammock. With swollen feet raised and my back uncoiled, I’m soon snoring after the long schlep up a mountain. There’s an agonizing process before any trip — do I take the hammock or leave it? Is the comfort worth the added weight and space? Hammocks are especially valuable in the Pacific Northwest, where two trees are never far from a scenic vista or lakeshore. And with today’s hammocks, when you take to the trees, you no longer need a flat patch of ground on which to sleep. 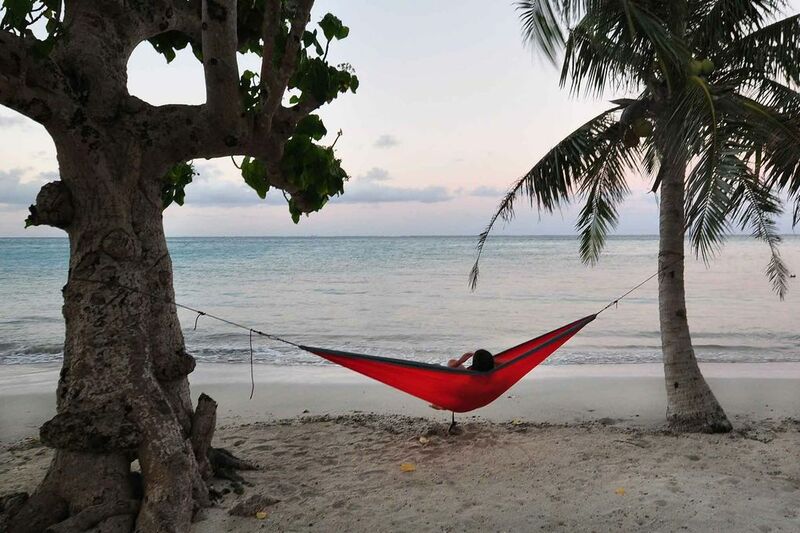 Modern hammocks have experienced a transformation in recent years. The backyard staples are lighter and more comfortable, and new designs have made them realistic options for travel, backpacking and casual camping. With summer right around the corner, here’s what you’ll need to sway in luxury. Eno DoubleNest ($70–$80 at eaglesnestoutfittersinc.com). Eno hammocks are classic starter options. The DoubleNest fits two, compresses to the size of a grapefruit and is lightweight enough to justify taking on a multinight backpacking trip. My wife and I took a DoubleNest around the world on our honeymoon. Even with limited space on the three-month trip, it topped the list of items we were thankful we packed. Therm-a-Rest Slacker ($70–$80 at thermarest.com). A good option from a Northwest company, the Slacker dries fast after the rain, so it only takes minutes before it’s usable again. It compresses into a rectangular stuff sack that packs nicely, and the stuff sack is handy for storing books and phones while you doze. As with most lightweight hammocks, it comes with carabiners and a stuff sack. Hummingbird Hammocks Ultralight Single Hammock ($65 at hummingbirdhammocks.com). Coming in at just 5.2 ounces, this Hammock is a great ultra-light option for through-hikes, that’s none the less rated for 300 pounds of suspended weight. It’s a 100 percent nylon hammock that dries quicky. 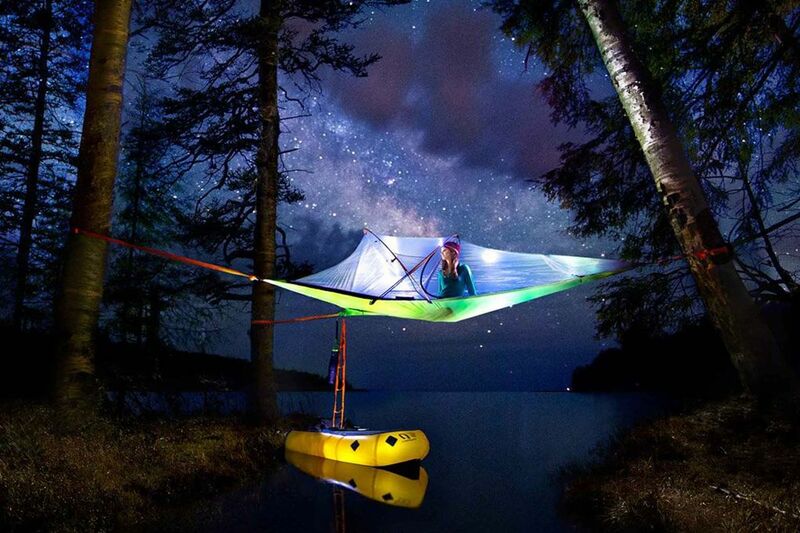 In recent years, the line between hammocks and tents has blurred. Leading the hybrid revolution is Tentsile, which offers tents on triangular platforms that can be suspended from three trees. The design not only offers the privacy of a tent, it also provides the ability to camp in unusual places, like over snow, spanning a stream or on steep rocky terrain. With multiple tree tents, you can stack them and climb between floors. And just try to keep kids out of these fun floating villages. The Stingray Tree Tent ($650 at tentsile.com) is a good three-person option. It easily fits two adults with room for gear, and has a cool trap door in the center, allowing you to enter from below (or exit into a boat if you’re camping above water). You can also drop into a small traditional hammock below for day lounging. 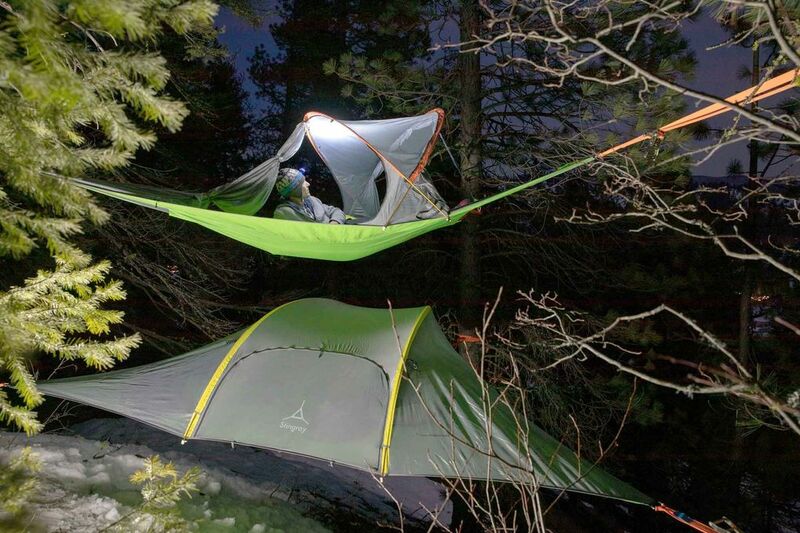 The Tentsile Connect Tree Tent ($450) is a two-person option with a built-in bug screen that unzips almost entirely, creating an airy lounge. Tentsile tents use heavy ratchets to achieve their suspension, so they are more suited for car camping than backpacking, but the Una ($250) is a single-person option that begins to approach consideration for short hiking trips. All you need to hang a hammock is a pair of trees and some straps or ropes. But if you’re planning to sleep overnight, there are some extras you might want to pack as well. UNDERQUILTS: The biggest drawback to hammock camping is cool drafts below your body. Sleeping bags alone will compress, reducing their effectiveness, and sleeping mats are awkward and breezy. 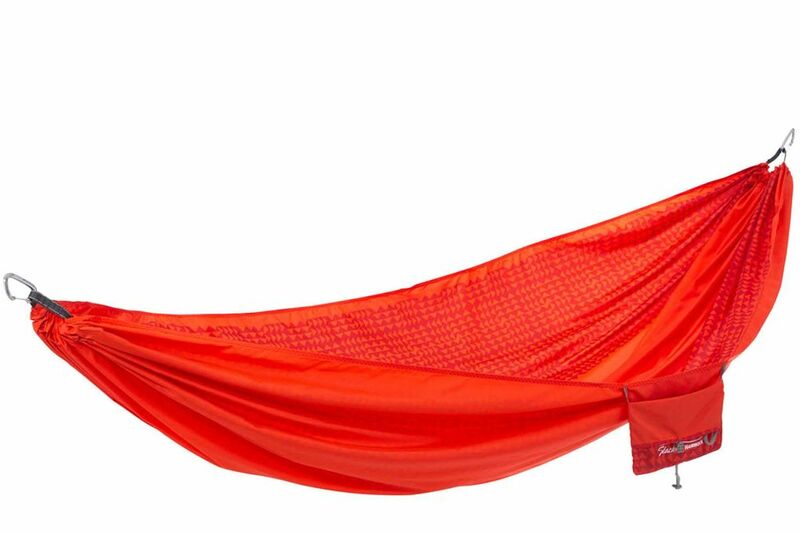 Underquilts, such as the Eno Ember ($100), are like sleeping bags for your hammock. They have straps that hook to the hammock, which reduces drafts and keeps your bottom nice and toasty while you sleep. And since they attach below the hammock, they won’t compress overnight. While not underquilts, the Therm-a-Rest Vesper ($320–$340) and Corus ($220) quilts are nice, lightweight options for top layers on summer outings. They’re not as bulky as sleeping bags, and they offer a bit of warmth below when lounging on top of them. 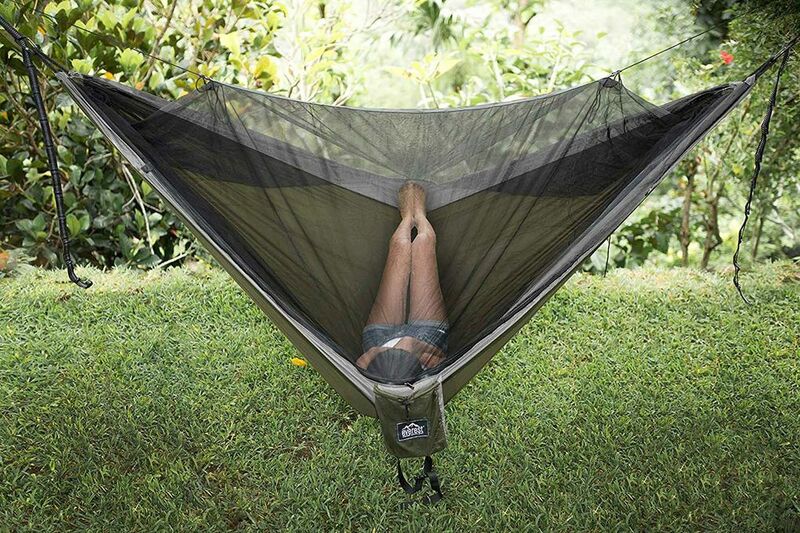 RAINFLYS AND BUG SCREENS: Some camping hammocks come with rainflys and bug screens included. If you’re camping in a buggy area, the Everest Double Hammock ($70 at amazon.com), for example, offers an integrated bug screen to fend off mosquitoes while swinging in style. The Hennessy Hammock Explorer Ultralite ($260 at hennessyhammock.com) is also a good choice for those who want an all-in-one rainfly and bug-screen package. If you want to use a rainfly you already own, make sure the edges extend well beyond your sleeping area, or blowing rain may soak your sleeping bag. STRAPS AND ROPES: Most hammocks come with clips but nothing to suspend them. I’ve traditionally used small sections of climbing rope, but there are more efficient options. The Eno Atlas Hammock Suspension System ($30 at REI) uses a series of integrated loops to save you the hassle of tying knots. Just clip your hammock’s carabiners into the loop that gets you to the ideal 15-degree angle for the most comfort. The set of two straps supports up to 400 pounds and works with most hammocks.